An illustration from 1858 on the closed and open Atlantic Ocean. South America and Africa look like they fit together snuggly, like puzzle pieces. It's so intuitive that children can grasp this notion without the aid of a formal education in geology. As an accepted theory, plate tectonics draws on evidence from several supporting disciplines, including paleontology and biogeography. Paleontology and geology are, of course, the primary fields where evidence for continental drift arises, the theory being largely proven by work from the recently deceased Dr. Jack Oliver. Evidence also comes in the form of the remarkably similar flora and fauna and the evolutionary patterns found within certain taxa. However, we must be careful with examinations of extant plant species. Despite the great distance, a remarkable number of plant genera have made the journey and now have established representative species on both sides of the Atlantic. Susanne Renner, of the University of Missouri and Missouri Botanical Garden at the time, published a review in 2004 of the 110 flowering plant genera in 53 families that have dispersed across the Atlantic. She based her work on a 1973 publication by the botanist Robert Thorne (of the Thorne system of classification) and expounded on the likely dispersal routes. Thorne, who lacked key data from gene sequences, identified 111 genera with trans-Atlantic dispersals. With the advantage of 31 years and molecular clock data, Renner revised this number by subtracting genera proven to not be monophyletic and adding previously unrecognized genera. 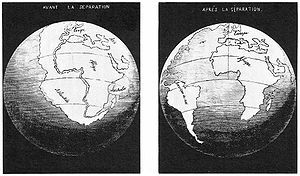 Most of these dispersals appear to be recent in terms of geological time and water currents can carry dispersal in both directions across the Atlantic, while wind currents are typically only responsible for transport from South America to Africa. Renner also thoroughly discounts the common speculation that plant trans-Atlantic plant dispersal could have been aided by birds, noting that it's unlikely given the circumstances of bird migration, dispersal, and digestion (frugivorous birds empty their guts frequently, so it is unlikely any seed eaten would survive the journey). 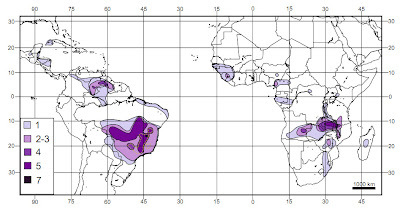 Renner, writing in 2004, does note that one genus, Genlisea, has a disjunct distribution due to "entry from the boreotropics" instead of long-distance dispersal. In other words, the evidence at the time pointed to a larger northern hemisphere distribution of the genus that crossed the North Atlantic either on then-connected land masses or over short spans of water. She therefore excludes it from her analysis. Genlisea is an interesting genus of about 22 species found in tropical South and Central America and Africa, including Madagascar. The center of diversity in South America appears to be in Brazil, where up to seven species may be found in one area. The species, commonly called corkscrew plants, are carnivorous, specializing in protozoans and small crustaceans. They're also rootless. 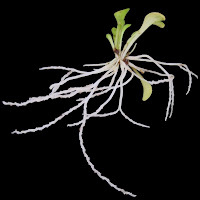 The semi-aquatic or terrestrial plants are anchored by their corkscrew-shaped traps that are actually modified subterranean leaves or highly modified stolons. There are some lovely publications out there with nice SEM images of the traps, but most are being paywalls, so you can feast your eyes upon these. 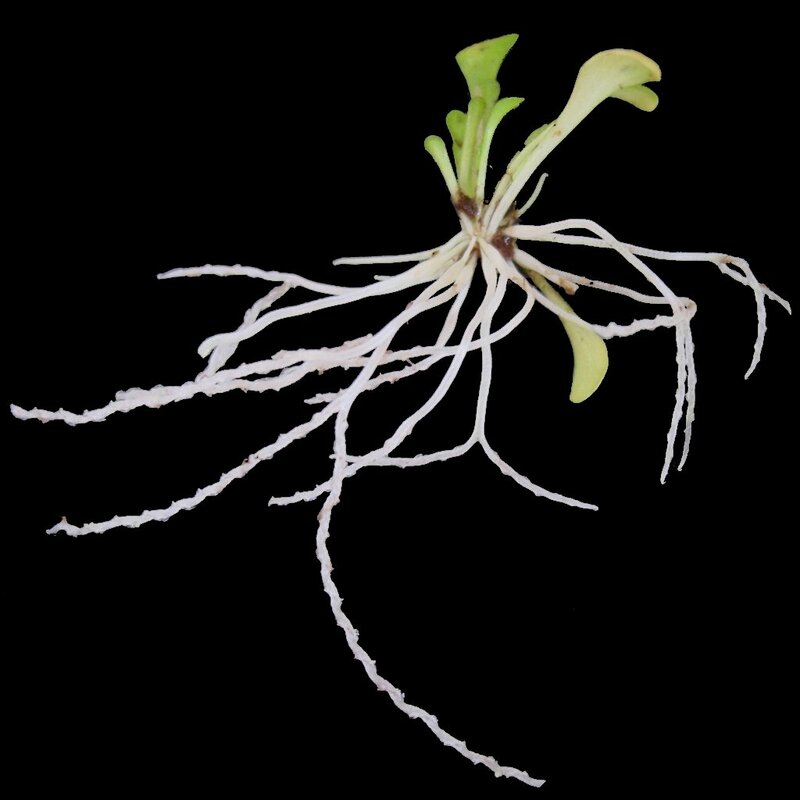 Further, the entire Lentibulariaceae family, of which three carnivorous genera (Genlisea, Pinguicula, and Utricularia) seems to be undergoing really rapid evolution to the point that some species, such as Genlisea margaretae, are shedding their genomes. Genlisea margaretae in particular currently holds the title for smallest known angiosperm (flowering plant) genome, with some chromosomes as small as bacterial chromosomes. Researchers believe that this rapid evolution could be the result of significant mutations they found in the key respiratory enzyme cytochrome c oxidase, which could be producing more reactive oxygen species, causing great damage to the plant's DNA, including whole helix-breaks and nucleotide substitutions. Fleischmann et al. 2010. Molecular Phylogenetics and Evolution, 56: 768-783. But beyond their fascinating morphology, carnivorous habits, and genetics, Gelisea are an interesting genus for their trans-Atlantic dispersal, now supported by data published in 2010. The data, consisting of three chloroplast DNA sequences from as many species as they could get their hands on, collected by Andreas Fleischmann and his colleagues indicate that the genus originated in the Neotropics, likely in present-day Brazil. There are two main divisions in the genus, one of which is wholly confined to South America (subgenus Tayloria). The other subgenus (Genlisea) originated in Africa, but one small clade of this subgenus are only found in the Neotropics. The authors first weigh the arguments for an ancient emergence of Lentibulariaceae when South America and Africa were still connected as Gondwana, but this idea is rejected since the family Lentibulariaceae is known to be relatively younger than the Gondwanan breakup. Instead, they propose the remarkable idea that the genus was established in Brazil, dispersed to Africa (likely by fast-moving currents in the Atlantic on "floating mats"), diverged and evolved in Africa, then made a second dispersal back to South America, where a group of species, which have a greater morphological and genetic affinity to those found in Africa, are located. Their case for this theory is well-supported. Just think about how amazing this is, though. Two dispersal events: a colonization of Brazil by subgenus Tayloria, then long-distance dispersal to Africa (founding subgenus Genlisea), a speciation event in Africa, a dispersal back to Brazil and subsequent re-colonization by members of subgenus Genlisea. I don't know about you, but I'm exhausted just thinking about the magnitude of this herculean genlisean effort. What happens to the time?